In our continuing series of blogger stories I’m handing the podcast over to you, our listeners, to tell your stories and tips of starting and growing your blogs. This series started in episode 221, and is helping us launch our new (and completely free) ‘Start a Blog’ course that will go live on 10 January 2018. You can sign up to reserve your spot in the course at problogger.com/startablog. Today’s short and sweet episode comes from My Happy Voice blogger Vahn Petit, and even includes a bit of singing..
Darren: Hello, is it me you’re looking for? I promised you that there will be singing today and there’s gonna be more. I’m sorry about that. The singing that will come will be bit better than that. Hi! Welcome to Episode 230 of the ProBlogger podcast. My name is Darren Rowse and I’m the blogger behind ProBlogger. A blog, podcast, event, job board, series of ebooks, and soon to be an album, maybe not, all designed to help you to grow your blog and to build some profit around your blog. You can learn more about ProBlogger at problogger.com. In today’s episode, we’re continuing our series of blogger stories where I’m handing the podcast over to you as listeners and as readers of the blog, to tell your story, to share your tips, to talk about the mistakes you’ve made, and to talk about the opportunities that your blog has brought you. This series did start back in Episode 221. It’s all about trying to inspire as many bloggers as possible to start a blog in 2018 because we’ve got this free course going live on the 10th of January, just a few days away now. You can still sign up to reserve a spot in that course, it’s completely free. Go to problogger.com/startablog. My goal, it’s a big one, is to see thousands of new blogs started this year because of this course. If you are thinking of starting a blog, please go sign up. Please get that blog launched. In today’s episode, you’re going to hear from someone who is gonna sing to you. She’s gonna give you some amazing tips. It’s a sweet episode, it’s not too long. 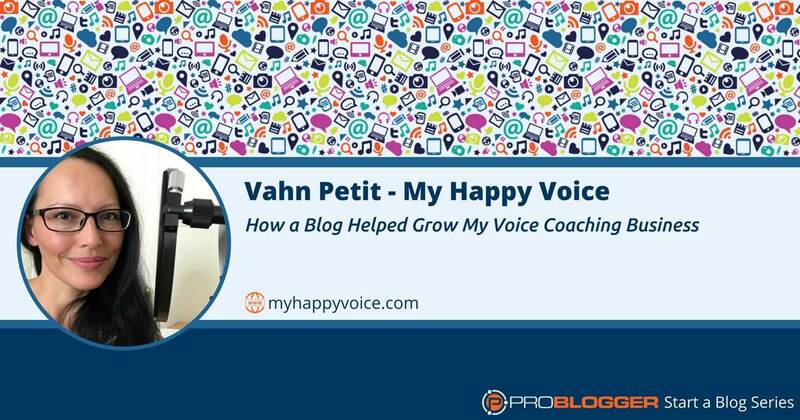 The blogger is Vahn Petit, who is a voice coach. She blogs at myhappyvoice.com. Love this episode, is lovely, and sweet, and has some great tips. I’m gonna come back at the end of the episode to share a few thoughts that I have on what Vahn shares with us. I’m gonna hand it over to her now. Vahn: Hello, Darren. Hello, ProBloggers. Hello, my name is Vahn Petit, I am a voice teacher and a vocal coach in modern music at myhappyvoice.com. I started my first blog in 2010. I just wanted a platform to share my journey as a vocal coach. At first, I was writing very short articles, very, very short articles with stories about what was happening in the studio, could be about a student having difficulties to sing a song and how we’re trying to fix it. I remember also I was posting each month a list of songs that had been studied with the links to some YouTube videos. I remember also I was sharing pictures and videos of the concerts of my students. I guess, at that time, I had several objectives. The main one was sharing stories and what was happening in the studio for my students so they could share the articles with their families. The second one was to find more students. I had a page with information about the singing one-to-one lessons, the group classes, and the workshops. I also was posting articles from time to time to attract people who wanted to take lessons. It went pretty well but probably because I started in 2010. I didn’t have that many competitors. I was ranking on Google’s first page without doing that much. That was really great. But then things started to change and my blog was kind of getting old. I had to renew, rebrand. Now, I have a brand new blog but I like the old one still. When I started my blog, it was not a big deal. Just me sharing my singing passion with friends, family, and students. I launched my blog with only one post. The about me page did not exist. I had no business plan but I’m so happy I did it that way and I did not wait for it to be perfect to launch it. I guess it’s a bit different nowadays because of the amount of blogs and online businesses. You probably need to have more than one post and several pages to launch. I’m really happy I did it that way. If I were to start a blog today, I think I would be the kind of person to postpone and postpone again. That was really great for me at that time. Being spontaneous helped me not postponing forever the launch of the blog. Mistakes, oops, I did it again. So many mistakes with my first blog and I’m still learning. The first mistake I can think about goes together with me launching my first blog with no content, just one article. I was doing things as it comes, as it goes. My blog had no visual identity, no consistency, no clear purpose for my readers. It was just me. Decided I wanted to write something that day and so I was writing. Maybe for three months there was nothing on the blog. Now it’s a bit different. For my new blog, I took a notebook and I wrote down everything from the colors I would be using, the different sizes for the images in the posts, the featured image, etc. The colors, the font, the font sizes. Everything is in my notebook. I go to it regularly when I don’t remember which color I’m using or which size or things to have a visual identity really strong. I’m much more consistent in the way I write, the voice I use. I remember you, Darren, speaking about the four voices we could choose. I think it was four. When we write, my voice is the professor artist, and it goes pretty well with being a vocal coach and a singer. The first mistake was the lack of visual identity, I think. The second mistake was I was so disorganized that I forgot to renew my domain name and my site went down for a whole week. I was using too many email addresses. I did receive a reminder to pay but I was not checking that email address anymore and the payment was not recurrent at that time. To get back my domain name, I had to pay around $200. Yes, $200. Don’t do it like me and try to be organized and write down the important things. Another mistake I can think about, I’m still struggling with that, is I am a learner. I love to learn and I get caught up in all the webinars hurricane. I registered in lots of webinars to learn about this and that. I ended up spending too much time doing that and not being able to even implement the tips I have learned plus I had no more time to create content for my blog. If you’re a learner, my advice is each time you find something you’d like to learn, register, learn, implement, and monitor what you’ve implemented. Don’t register in 7 or 10 courses or webinars. One at a time is the right thing to do, in my opinion. The good things that have happened to me since I started my blog is opportunities. I’m sure I wouldn’t have met that many interesting people and really professional singers and I’m even coaching The Voice singers and actors. That’s very, very interesting for me because it’s a different level of teaching. It’s not teaching anymore, it’s coaching. That’s why we say, “I’m a voice teacher but I’m also voice coach now.” I still love to teach the beginners and I love to coach the professionals. That is thanks to my blog, I think. My number one tip for new bloggers would be to take your readers on a journey, on your journey. That starts with stopping comparing yourself to others. It’s as if wanting to write a love song and being so depressed because there are already so many love songs. But hey, only you can write it your way, so don’t compare yourself to others. To take our readers on our journey, we have to be honest and be ourselves, to interact with them the most as we can, and to be consistent so they feel part of our story and they don’t feel let down ever. Blogging is a virtual thing but we’re only human after all. We’re only human after all. That was very, very nice to speak to you, bloggers. Thank you very much, Darren, for inviting us to share our story, our blogging story on ProBlogger podcast. Bye. Darren: Thanks so much for your story today, Vahn. You can find Vahn’s blog at over at myhappyvoice.com. A few things that I love about this particular episode apart from the singing and wonderful accent, just to mix things up a little bit. I love that Vahn uses her blog to grow her business, and again, this is another example of a different business model to what many of us start out blogging. Many of us start out thinking that we’re gonna make money from advertising or selling ebooks or virtual products. Blogs are very powerful at doing all of those things but they’re also a fantastic way to find new clients and grow your profile in an industry and that’s something that this story illustrates really nicely. I love the advice. Don’t wait for it to be perfect to launch. Whilst I’m a big believer in doing what you can before you launch your blog and setting up with good foundations, that is some great advice there. You can really have the intention of making it perfect before you launch to the point where you don’t actually launch anything at all. That’s something that we really wanna encourage you through this course that starts on the 10th of January to not just get the things right but to actually get it launched and to perfect it after it’s launched. It’s better to get it launched imperfect and to get things fixed up on the go afterwards than to wait until it’s perfect to launch. Because you’ll never actually launch it if that is your strategy. Yes, get it looking good. Yes, get some articles ready before you launch. But get it out there as well. Really good advice there also around some of the mistakes that Vahn made along her way as well. Not being consistent nor organized. I love the advice there particularly thinking about the visual identity of your blog. I guess what you’re trying to do there is put together some sort of a brand, a key that’s going to help you be consistent with that. I like the idea that she had this notebook that had all the colors that she’s gonna use. That’s something that I think a lot of bloggers could learn from whether you’re starting out, that’s something good to think through in the early days. But also for those of us who’ve been blogging for a while, it can end up having a very messy looking blog as well. Think through some of the, I guess, visuals and the brand that you wanna portray. Something that might be well worth doing at this time of the year, the start of the year. Maybe you could give your brand a refresh as you move into 2018. Also, I like that she mentioned there being consistent with her voice. She mentioned some teaching that I did on that particular topic, and if your ears picked up at that point of wanting to know what those four voices were, you can go back and listen to episode 213 where I talked about some teaching that I picked up from Jeff Goins where he talked about four different voices that almost any blogger could write in and the prophet is one of them. I actually suggested quite a few more. I think I came up with about 20 different voices. If you wanna learn a little bit more about voice and thinking about the voice that you have needs to be authentic with who you are but also thinking about your audience and what you are trying to help them with, go back and listen to episode 213 and you’ll pick up some thoughts there. It is quite a long episode, kind of halfway through it will get into that stuff on voices or you can just look at the transcript there as well. Another great point there is too much time learning, not enough time actioning. This is something I see a lot of bloggers falling into the traps of online entrepreneurs. There’s so much advice there on the topic of blogging. You could spend your whole life learning about blogging and not actually do any at all. This is something that I’m really aware of particularly as we’re creating courses and we’re creating content. You’ll know that we’ve pulled back on our content creation this year partly because we don’t want to feed the beast of those of you who are just learners and addicted to learning. We wanna create some teaching for you but we don’t want you to spend your whole life reading ProBlogger articles and listening to ProBlogger podcast. I love the fact that you are listening but if you’ve listened to more than five episodes today, maybe it’s time for you to write a blog post. That’s my advice for you today. Yes, to learn. Yes, pick up the latest trends but put plenty of time aside to implement and to monitor what you’re doing as your advice in that particular episode there. I just love the way that Vahn finished off her story today. Take your readers on your journey. Only you can write your story so own it, be yourself, don’t compare yourself to others, make your reader a part of your story. You’re a human being and so are they and the big thing that we love to do as humans is to connect with one another, to hear each others’ stories. Own your story, don’t try and be someone else. Don’t try and pretend and compare yourself and fall into that trap. Be yourself and take your readers on a journey. Thanks so much for sharing your story today, Vahn. I really do appreciate all the advice. Check out her blog at myhappyvoice.com. You can also find today’s show notes at problogger.com/podcast/230 where you’ll also find a link to our Start A Blog course. I’d love you to join us on our Start A Blog course. If you’ve been thinking about starting a blog, maybe to earn an income directly or maybe just to share your story or maybe to help build your business, whatever it is that is your intent, this course is designed to help you set up a blog with great foundations, to help you achieve your goals whatever they may be. You can find more details on how to join that course at problogger.com/startablog. As I mentioned yesterday, we’re gonna have a Facebook group that will help you to connect with others at that same point of the journey and hopefully we can all grow our blogs together as a result of that. Again, it’s problogger.com/startablog. Lastly, we’ve got two more episodes coming in this series of blogger stories. We’re gonna have a little break for the weekend now. That will give you an opportunity if you do wanna dig back into the last few episodes. This series started back in Episode 221. There’s plenty of stories there to dig into over the weekend but I’ve got two more coming for you next week before the Start A Blog course does launch. I look forward to chatting with you then. The post 230: How a Blog Helped Grow My Voice Coaching Business appeared first on ProBlogger.